Submitting your content for sale in the Reallusion Marketplace is a simple process. 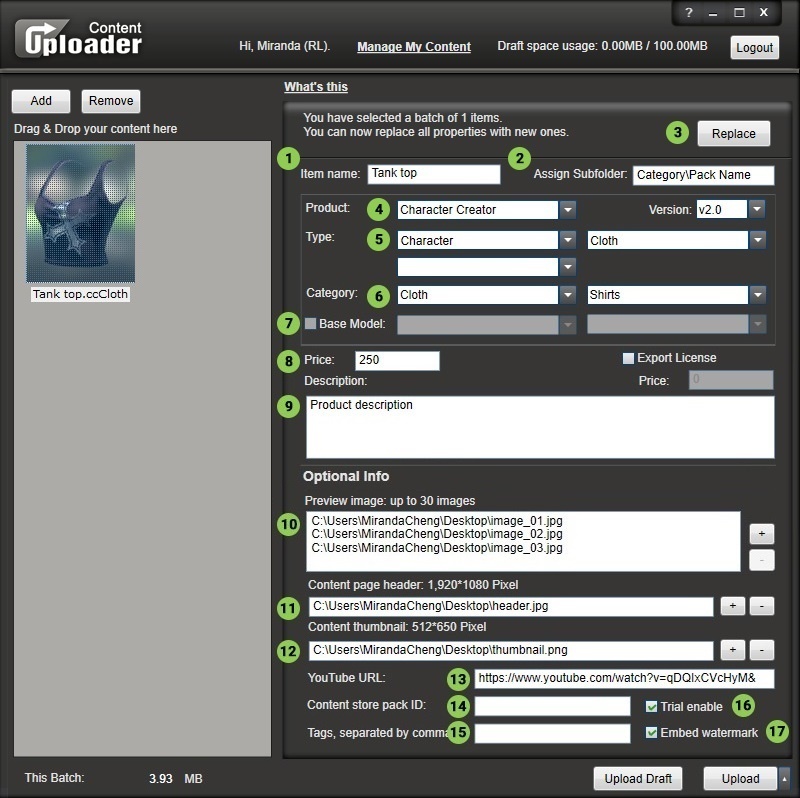 Once you have the content ready, you can submit it using Reallusion's proprietary Content Uploader. Sell it as a single item or as part of a tidy combo pack with the assistance of the Marketplace Management Backend. The choice is yours to make! The Content Uploader is an easy tool that streamlines the submission process. You can edit and save your content information before uploading, and once you upload the content, it will be accessible from your Marketplace Management Backend. Aside from the content files, you can set the name, description and price of the specific items and upload promotional materials all at once. Import the content files from your desktop to the Content Uploader by loading them in or use drag-and-drop. Edit the information of your content before uploading or upload multiple files at the same time and do the final editing in Marketplace Management Backend. Activate the option for "Trial Enable" to allows users to try before they buy. If the "Embed Watermark" is enabled, users cannot freely share the content to those who haven’t purchased it. Item Name: The name on the website. Changing this value doesn't effect the actual content that is uploaded. Assign Subfolder: The installation directory for this content. Replace: Update the files of an existing content. Input the content ID of this existing content and clicking the “Replace" button. Product / Version: The compatible product and software version. Category: Corresponds with the category organization in Marketplace. Base Model: Select the base model for this content. This is used for creating assets for iClone G2, G3, G5 character. Price: Product price in DA points. 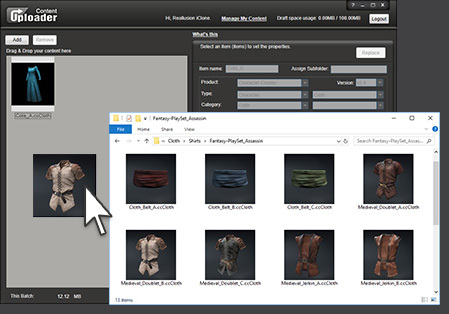 Only iClone/Character Creator content is applicable for the Export License. Description: Input the product description from the Uploader or log into the Marketplace backend to use the text editor. Tags: Helps to categorize items for the search function. We suggest including the pack and item names. Embed Watermark: Prevent users from freely sharing the content to those who haven’t purchased it. If users don’t own the content, watermark will be displayed on the viewport. (checked on by default). Note: some formats cannot be watermarked, i.e. .swf, .iScene, .png, etc. 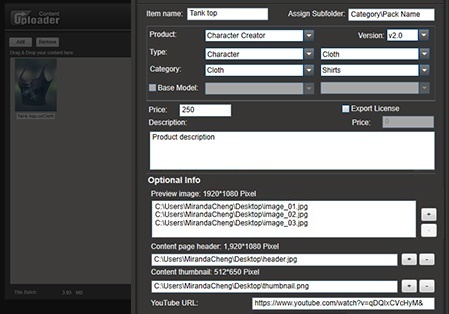 After you upload the content to the backend in Marketplace, you can select the desired display categories and publish to your personal store. After that, these content items will appear in the Marketplace which can be accessed from the category navigation, search bar and any other store mechanism. 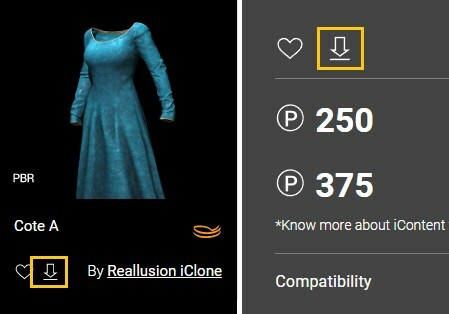 Reallusion Marketplace is a complete C2C platform which is designed to provide an intuitive and easy-to-use "try before you buy" experience. According to our sales statistics, a high proportion of sales are a direct result of users testing out the assets before they purchase. We strongly encourage you to enable the trial feature on all of your offerings.